Let's get rid of those pesky dealers! A letter published recently in one of our philatelic publications provides the fodder for this month’s lineament. Only an uninformed individual could make such statements. One also wonders why such drivel would even be considered for publication. The simple facts of life are that, if one were to remove the professionals from our hobby, stamp collecting will join the ranks of other pursuits such as collecting seashells or matchbook covers. Without an established dealer base to buy and sell philatelic material there can be no viable market. Without an established and ethical trade to support philatelic values, the selling of stamps would be just as easy as selling those matchbook covers. Without any value base what would be the incentive for anyone to spend any money on a stamp? 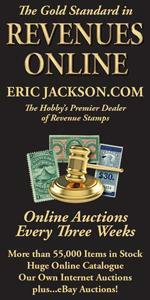 Remove the dealer advertisements and every commercial philatelic publication would close. It is the professional dealer who subsidizes our publications by advertising. It is also the professional who, without much recognition, helps to finance most of our major stamp exhibitions and shows. This is done through booth rentals, advertising in the program, donations to the awards committee and several other areas as well. More importantly it is the professional dealer who risks capital in buying stamp collections when they are offered for sale and for which there is no immediate buyer. The collection is then broken down and the stamps properly identified. The stamps are then placed into stock without any assurances that any will readily sell. It may take years until a collector desires one of those stamps. It is this ready willingness to buy that places philately on a sound financial footing. The aforementioned letter writer also says that, “The general public does not perceive the potential investment value of stamps”. Stamp collecting is not an investment. It is a hobby that is designed to provide pleasure and relaxation. If one wishes to invest, there are stocks, bonds, mutual funds and many other avenues in which to channel funds. Unlike spending a couple hundred of dollars for a pair of concert tickets that have absolutely no secondary value, and the show all but forgotten about months later, stamps not only provide incalculable pleasure while in our possession. The added bonus is that there is always some recouping of cost. What we may expect to receive depends to the greatest extent on what we have bought over the years. The astute collector who relishes quality over quantity and who chooses the early stamps of which supply is limited and demand great, will reap many rewards especially if there is a keen eye toward the stamp’s quality. Established professionals will compete very strongly for a collection of this caliber. Those who purchase off-centered stamps or those with flaws should not expect to derive a retirement income when the time comes to sell. It is our belief that this letter writer and many others are frustrated over the fact that some collectors write in to complain about some low percentage of the Scott Catalogue value that was offered for their collection. We wonder if those same individuals ever take into consideration the fact that the Scott Catalogue values each stamp in the grade of very fine and without any flaws. We are still awaiting the collector who will offer us a collection in which every stamp is sound and grades very fine at a minimum. The Scott United States Specialized Valuing Supplement is a great tool for ascertaining the approximate retail values of stamps in grades from average through superb. For example, a fine stamp may retail at 30 percent of the very fine example. The stamp dealer is not unlike any other merchant. There are expenses to consider such as rent, utilities, taxes, salary, insurance and a host of other expenses. Other hobbies, from antique firearms and coins, to toys and teddy bears, have dealers operating businesses in much the same way. Perhaps that dealer offering 20 percent of the very fine catalog value for a particular collection was doing so because that was all it was worth in order to obtain a reasonable profit. Dealers and collectors must live together in harmony and with mutual respect if our outstanding hobby is to grow and prosper.